Professor Long has research interests primarily in the area of financial economics. In his pub­lished articles, he has addressed many of the financial decision problems faced by individuals and firms. These include total savings and portfolio-selection decisions (with particular emphasis on income tax implications and the performance of sophisticated portfolio-selection techniques), investment-project evaluation and dividend-policy choice. In other articles, he addresses the behavior of rel­a­tive asset prices, the measurement of “abnormal” asset returns, the implications of taxes and inflation for common stock prices and the term structure of interest rates. With Charles I. Plosser, Long has done theoretical and empirical research on fundamental interpretations of fluctuations in economic activity (business cycles). 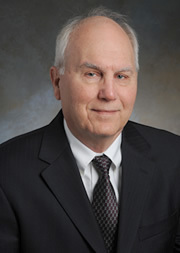 Long is a past editor and advisory editor of the Journal of Financial Economicsand a member of Beta Gamma Sigma. Using Proxies for the Short Rate: When are Three Months Like an Instant? Realized excess returns on long-term bonds are determined entirely by percentage revisions over the holding period of forecasts of pricing kernel values at the end of the holding period and at the long-term bond maturity date. Excess returns expected at the beginning of the holding period are determined by the conditional variances of these forecast revisions. We are exploring the power of this view to explain strong observed regularities in excess bond returns.